The Affordable Care Act, commonly known as ObamaCare, has four new health insurance plans, listed from least expensive monthly premium to the most: Bronze, Silver, Gold, and Platinum*. All “metal” plans will all offer the same Healthcare Exchange essential benefits, regardless of any additional or extended benefits an insurance provider offers. 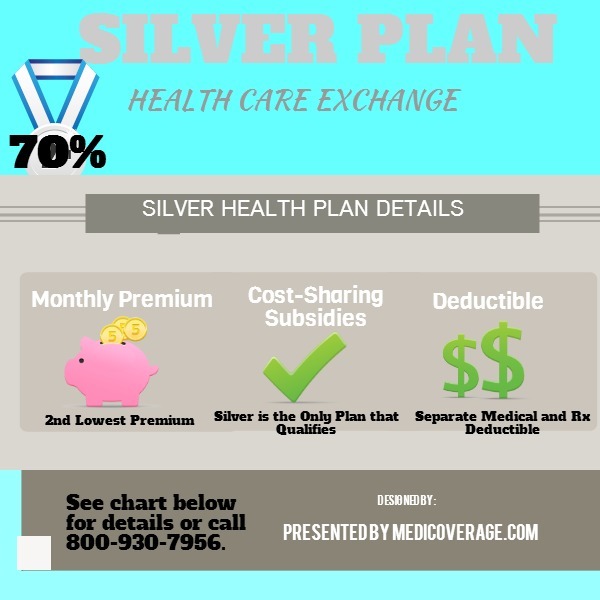 Silver is considered the standard of these plans, offering a low monthly premium with the second highest cost-sharing (combination of deductible, copayment, and coinsurance). *There is also Healthcare Exchange Catastrophic coverage, for those who qualify. The following information below is for individual and family members. Click here to learn about how the Silver plan works for Small Business owners. *This is California’s breakdown of the Silver. For specific information of your state’s plan click here for a health insurance marketplace quote. How many Silver Plan Deductibles will be offered? Depends on the provider and state, as both may interpret the plans separately after meeting the essential benefits. Silver plans will have both different deductibles (the amount you pay before the insurance company pays for health services) and coinsurance (the % you pay after the deductible is satisfied and until you meet the out-of-pocket max). How Does the Silver Plan Compare to the Other New Plans? Silver is the standard plan, it must be offered, if any plan is offered by a provider, and, as we said above, Silver is also the only plan that offers cost-sharing reductions for out-of-pocket costs. Silver offers a relatively low monthly premium, with a fairly low deductible, so that a member may manage his/her costs. Click here to compare Bronze Plan, Silver Plan, Gold Plan, and the Platinum Plan side-by-side. Seniors do not have the same options under the new Health Care Exchange. Click here to learn more about ObamaCare and Seniors. For any questions or assistance in applying, please contact Medicoverage. If you’re ready to enroll in a Silver plan fill out a Health Insurance Marketplace application. Good news! If you both you and your wife end up losing your jobs, you will be entitled to a Special Enrollment Period. Just don’t delay enrollment because usually you need to apply fifteen days before your effective date begins. And, the max out of pocket includes Rx costs. I have silver plan. What does silver plan cover? How long of a waiting period I will have to wait? Thank you for your question. Since each provider can offer different coverage, you would want to look at your current summary of benefits from your insurance provider or call the number on the back of your card. Thank you for reaching out. Click here to get an instant individual/family health insurance quote. We can also help you over the phone at 800-930-7956. Thanks for your question. If your income falls within the Medi-Cal range you have two options 1) accept Medi-Cal, or 2) pay full price for your premium, as you don’t qualify for subsidies on the Exchange if you qualify for Medi-Cal. For further questions call 800-930-7956. If I have a family and the family deductible is $12,500, ind 6,250, and 1 person runs up a $25,000 bill which deductible applies? Great question. While those deductible numbers seem high for a silver plan, many states allow providers to set much higher deductibles than the CA $2000/$4000 listed above. The answer to your question depends on how the private insurance provider has set up the deductible. Our current understanding is that some providers are offering “embedded deductibles” while other are offering “aggregate deductibles.” If it’s an embedded deductible, then the $6,250 number applies in your scenario above. An aggregate deductible would require the full $12,500 to be met before the deductible has been satisfied. I am a NH resident, and am being offered Anthem “Secure Silver” coverage through my employer, Securitas, at a lower monthly premium ($52/week) and a lower deductible ($1,000 in network) than your “Silver” plan. Is this because my employer shares in the cost? I’ve not previously needed health insurance from this employer but am in the process of getting a divorce and have agreed to be responsible for my own coverage. I want to make a good decision. It sounds like the coverage being offered through my employer makes sense, even though it might seem expensive to an “outsider” whose coverage is much less through an employer (for example, my sister who works for the State of NH). Can you comment? I have to sign up by Nov. 15. Thanks for your question. Without seeing the specifics of your plan, our best guess would be that your employer is paying toward your premium. You should check with your HR manager. As for your lower deductible, the Silver deductible is not necessarily $2000. The $2000 number is an estimate based off of California’s figures for individual coverage. Silver deductibles vary in other states and your company’s group plan may work differently. Our best recommendation is to request an Explanation of Benefits from your employer. My wife and I have two children and one due this September. Our ages: I am 52 (I have Hep C and diabetes), my wife is 35 and our two children are 13 and 10. Our current household income (including child support) is apprx $30,000 per year. We are currently covered by Badgercare. My wife and I will not be covered after the birth of our child. Thank you for writing to us. As far as we know, Wisconsin is not expanding Medicaid, therefore your family is more than likely not qualified for to receive Medicaid. However, with the new ObamaCare plans there are both premium subsidies to help with your monthly costs, as well as cost-sharing subsidies to help with your deductible, coinsurance, and copayments. As well as, with the new Affordable Care Act, pre-existing conditions no longer preclude someone from enrolling in an insurance plan or charging you more because of your condition. To learn if your family qualifies for subsidies or for any other questions call 800-930-7956. For the Silver Plan it says there is a drug deductible, but does it only apply to brand name prescriptions? Thank you for writing to us. To our best knowledge, the deductible is only for brand name drugs. As this plan is based off of California’s preliminary figures, you should give us a call to figure out the best plan for you at 800-930-7956.